These boots were made for…sailing…and that’s just what they’ll do. One of these days these boots are gonna…sail…on over to you. Ok, we’re paraphrasing. But we can’t help it. 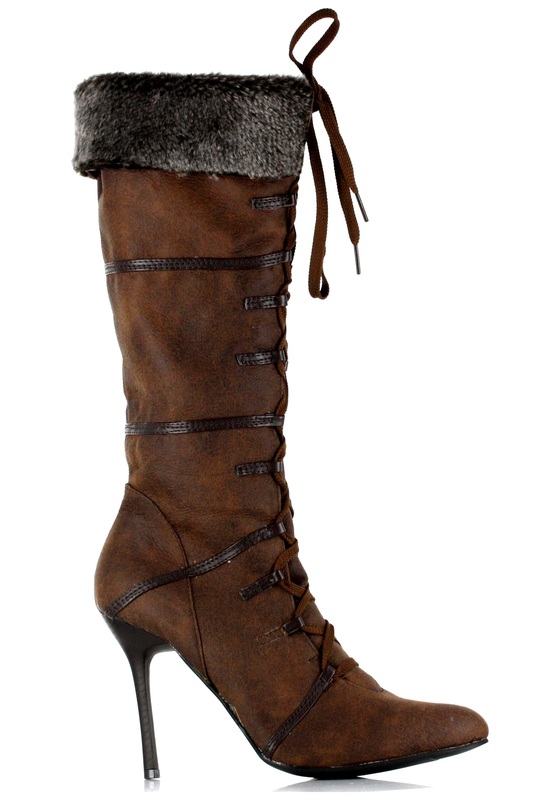 These sassy brown boots inspire spontaneous song in us. Maybe that’s because the reign of the Vikings was one of power, adventure, exploration, and thrill. Maybe we just can’t help wanting to lace up these weathered heeled boots with a feisty fun costume and storm the office, singing all the way. Maybe we’re channeling some primitive knowledge that Viking ships are really where modern karaoke was invented (trust us, we’re highly intuitive). Or we could just be nuts for faux fur trim. The point is, any way you lace them, this beaut of a boot will have you feeling giddy with the anticipation of your next expedition out the door. So don your most festive costume and grab a gaggle of your beloved co-adventurers—surely you’re bound to discover an evening worth singing about.